The best way to contact Capt. 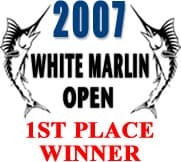 Randy Butler about booking an offshore Virginia Beach charter fishing trip is to submit a BOOKING REQUEST. Afterwards, he'll follow up with you as soon as he's able to either by phone or email. **PLEASE NOTE** He spends 90% of his time either; fishing or hunting and does not have phone service while fishing offshore. Simply, leave him a message on his voicemail and he’ll return your call as soon as he's able to. If it’s an emergency, you can always call the Virginia Beach Fishing Center at (757) 491-8000 and they’ll do their best to get in contact with him via the radio. **ALSO NOTE** Although, Capt. 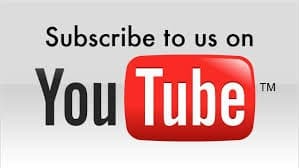 Randy prefers you BOOK YOUR TRIP either ON OUR WEBSITE or by CALLING HIM DIRECTLY, the fishing center will be able to place your booking with us. However, IF YOU DO END UP CALLING THE FISHING CENTER TO PLACE YOUR BOOKING => PLEASE MAKE SURE THAT YOU REQUEST THE REBEL! The boat is docked and departs from the VA Beach Fishing Center. The boat is docked just to the left (viewing from parking parking lot) of the Virginia Beach Fishing Center sign. See photo & map below. 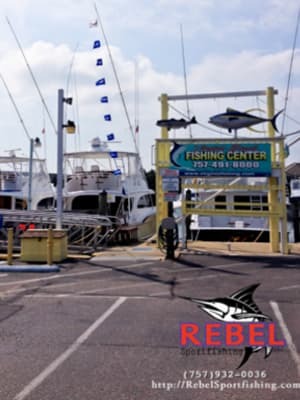 Picture of the VA Beach Fishing Center sign where the Rebel is docked. *It's the boat directly to the left of this sign. Park anywhere in lot and please be mindful that the handicap spaces are marked on the pavement. FISH ON => Book NOW!